For Maasai churches in the midst of Kenya’s savannah landscape, the congregations’ comings and goings depend on livestock. 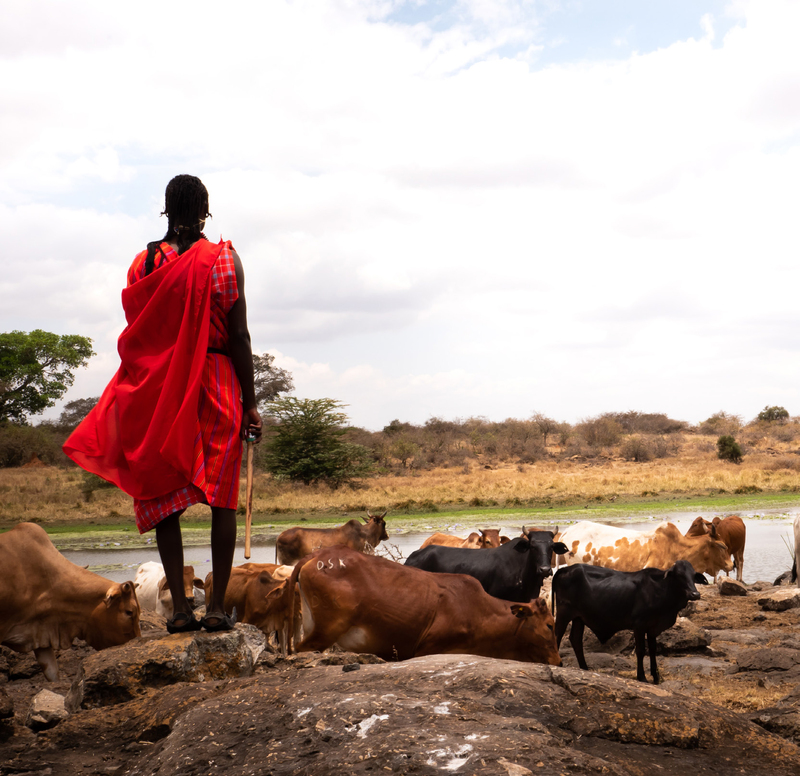 The Maasai people who make up this and many other congregations in Kenya are semi-nomadic: they depend on their cattle for their livelihood and must find water in order to survive. And during the long dry seasons, the search for water regularly takes them far from home, family, and church. When there’s no water, churches in Maasai areas can be unsustainable. One of these churches, Empuyiankat Word Provision Church, was a small, struggling group of believers who met to worship under an acacia tree. They had no building, and during the dry season they sometimes had no worshipers. In response, Dr. Wa Kitavi has been working with Bishop Daniel Koinet and with mission-minded supporters like you to help train Maasai Christians. Together they’ve brought Timothy Leadership Training (TLT) to Maasai communities. Pastor David Kompe of Empuyiankat Church was one of the first leaders whom Dr. Wa Kitavi invited to be part of TLT in Kenya. The lessons Pastor Kompe learned during TLT inspired him to serve his community by tackling their biggest and most life-threatening problem: limited water supply. Empowered by TLT’s teachings on caring for God’s people and Christian stewardship, pastor Kompe sought partners who could help him build a reservoir that could last through even the worst drought. With help from the local government and a nongovernmental organization called Kajiado Arid Land Development Organization, the congregation rolled up their sleeves and got to work. Their plans called for a wall nine feet tall and over 200 feet wide across a seasonal riverbed. Members of the Empuyiankat Church collected many of the necessary building materials from the rocky savannah, including the large stones to make the wall. The church community provided all their own labor to stack and cement those stones together. They named it “Jerusalem Wall”—then they waited for rain. When the rainy season began, the new dam worked beautifully, and the reservoir filled to the brim! Now ducks swim and fish jump where before there were only dry rocks and dead grass. Herds of cows, sheep, goats, and other animals come from every direction for the life-giving water of Jerusalem Wall. And with the cattle come the people who care for them. Before, the water and people both would come and go. People follow the water. But now when they follow the water, people fill the church just like the rains fill the reservoir. The Christians at Empuyiankat knew that their reservoir would nourish and strengthen the cattle —their livelihood—but they did not predict its impact on their community. The church is growing. They provide water for their cattle at the reservoir and water for people’s hearts through their church. The wider community is taking notice of how these Christians want to serve. Other churches are seeking to reach out to their neighbors too. After seeing the success of Rev. Kompe and the Empuyiankat Word Provision Church, Bishop Koinet is working with other area churches to develop similar projects to strengthen nearby communities. One nearby church has gathered all the materials for their own dam and is ready to begin construction as soon as cement arrives. Thank you for partnering with Pastor Kompe and Empuyiankat Church through Resonate! The wave of change you’ve helped to start in Maasai communities is only a snapshot of what God is doing all over the world through your support. Where once there was only dry ground, people can now come and find living water.